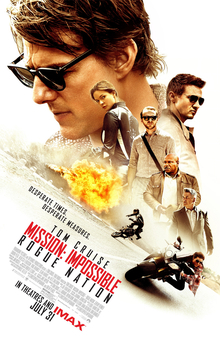 Ready for some more crazy action, Mission Impossible: Rogue Nation can be one of the possible contending summer blockbuster movies that just may confuse you enough to be an amazing story! Tom Cruise has done it again, playing the mysterious and intelligent Ethan Hunt, bringing you the fifth installment of the “Mission Impossible” series. Also as the producer of this movie, he had a part in this intense and very unique story. The IMF, after it’s great years of rogue missions has left suspicion to the C.I.A. which leads to their disbandment. Jeremy Renner as William Brandt, Simon Pegg as wiz-kid Benji, and Ving Rhames as the awesome Luther Stickell all together to catch Ethan Hunt and his search for The Syndicate. Lead by mastermind Solomon Lane (Sean Harris), the syndicate plans to take over the system of the government as it appears corrupted but is killing thousands of innocents in the process. It is up to the IMF, in confidentiality to follow the clues, withhold evidence of the syndicates existence and putting trust back into the IMF and the world. One unique character in this film is llsa Faust (Rebecca Ferguson) who plays as a rogue agent for both parties (Lane and Hunt) and becomes used and only seeks freedom at the end. She was put under the trust of Lane however, will try to deviate from his orders to soon be searching for key British intelligence with Hunt…and then betray Hunt to go back to Lane. Overall, this story line and plot was phenomenal and really thought out. It always kept me on my feet and as soon as I would expect something to happen, it would twist in another direction that only benefits the story even more! Director Christopher McQuarrie having his debut with this movie (Compared to director Brad Bird for Ghost Protocol in 2011) really pulled the focus when necessary. He was able to make effective transitions between stories at least not to lose track of the constant intelligence information being passed between different parties. This movie, as expected was very action packed, had great stunts and excitement…and fun fact, that plane stunt you see in the trailers, that was 100% real. NO CGI OR ANYTHING! Imagine how Tom felt about doing that. It only adds to the excitement that this movie delivered! The editing, the score (bringing back the original theme and all off the other great music), as well as the sounds of the action were booming! I was able to see this in IMAX and I highly recommend seeing it in IMAX, however if you think otherwise, this is still a great watch and you won’t be disappointed!